On March 7, 1974, New Orleans became the 18th member of the NBA as a nine-man group headed by Fred Rosenfeld and Sam Battistone paid $6.15 million for the expansion franchise. Then on May 3, 1974, Pete Maravich was acquired by trade from Atlanta, becoming the first player in franchise history. That spring, a contest was held to name the expansion team. Of the more than 6,500 names submitted, eight semi-finalists emerged: Jazz, Dukes, Crescents, Pilots, Cajuns, Blues, Deltas, and Knights. 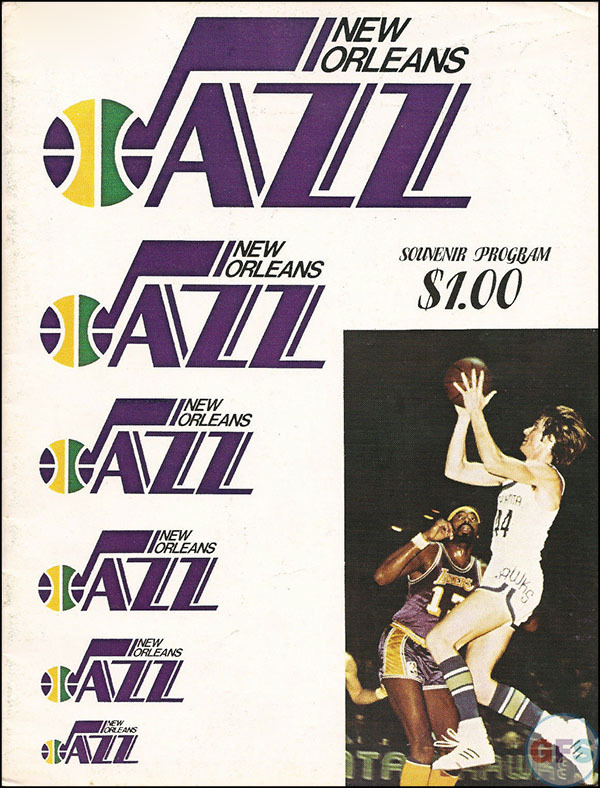 After much deliberation, team officials announced that the new team name would be the New Orleans Jazz on June 7, 1974. Three contestants had entered the Jazz name with the same postmark date, so team officials had Miss New Orleans 1974, Kay Johnson, choose a winner out of a hopper. That winner was Steve Brown, a 27-year-old broker and transplant New Yorker. Brown, a self-proclaimed Jazz freak who had once played in a league with Julius Irving, said, I grew up on Knickerbocker basketball, but this is my team now.” He received two Jazz season tickets and a trip to the 1975 NBA All-Star Game in Phoenix. As the undisputed “jazz capital of the world”, the city embraced the new name. And, for the second time, Jazz had been born in New Orleans. To convey a distinct Mardi Gras theme, purple gold, and green colors were used and the logo featured the ‘J’ as an eighth note. The team colors were actually selected prior to the name.